A new and captivating generation of motor vehicle is sweeping the automotive market into a frenzy. Despite the longevity and the constant quality the crossover offers, the crossover has primarily gained its accentuated reputation in the automotive industry within the last ten years. Why is this? First, the crossover vehicle is the perfect hybrid between the sedan and the SUV (Sport Utility Vehicle). The crossover in its creation utilizes components captured from both vehicles, including features such as the build, design, and aesthetic, combining them seamlessly and expertly. Tall interior packaging and H-point seating. Much like the SUV, the crossover offers its drivers high seating configurations that allow increased safety and increased interior space. All-wheel or four-wheel drive capabilities. Although the crossover is typically designed for minimal to light off-road usage, most crossover vehicles come equipped with standard all-wheel or four-wheel drivetrain options. Large trunk space/liftgate hatches. Designed with a moderately sized trunk that sits somewhere between the hatchback and the SUV, the trunk space of the crossover is always accessed via a liftgate hatch. A two-box cargo design, much like that found in the hatchback/sedan allows second row seating followed by trunk space accessed by a liftgate. Flexibility in seating arrangements; i.e., folding down seats. The crossover handles like a sedan or hatchback, is lighter in weight, and therefore boasts favorable fuel economy specs compared to the SUV or truck. That being said, some crossovers are better than others in terms of affordability, safety, and efficiency. In this post, we’ve gathered 2017’s top crossovers, and are prepared to give you the inside scoop on everything you need to know about the crossover. The 2017 Nissan Rogue is a fine example of how the crossover seamlessly combines the utilitarian elements of the SUV whilst maintaining a vaguely sporty aura about it associated with the hatchback/sedan style of vehicle. 5-liter engine, with inline-4 cylinders. 170-horsepower with 175 ft-lbs. of torque. FWD drivetrain, with AWD options available on select models. Excellent fuel economy of 26 city MPG and 33 highway MPG. A continuously variable-speed automatic transmission. As you can see, the 2017 Nissan Rogue offers the size and the space of an SUV while maintaining the mechanical performance of a sedan. Features ranging from the Rogue’s relatively small 2.5-liter engine size to its perfectly efficient 170-horsepower point all of its mechanical fingers towards the sedan, or small hatchback. That’s not to say that the Rogue is a small ride. In fact, the Rogue is quite the contrary, and is considered one of the largest crossover models in the automotive market today. Specs on the overall size of the vehicle reveal that the Rogue very closely resembles that of the SUV. The 2017 Nissan Rogue offers an impressive ground clearance of 7.8 inches. Most crossover vehicles offer less than seven. This speaks for the Rogue’s tall frame platform design, which is a staple utilitarian feature of the modern SUV. With a headroom space of 41.6 inches, the Rogue also offers almost three more inches of interior headroom than the other of 2017’s top crossovers. Three inches doesn’t sound like much, and in theory it isn’t, for in terms of interior headroom it is a reasonably impressive amount. The 2017 Nissan Rogue measures (in inches) 184.5 X 72.4 X 66.3, and is longer from front to back than either two of 2017’s top crossovers. Standard anti-theft systems (only optional with the other two crossover models). Child seat anchors, and side/curtain airbags. The 2017 Nissan Rogue was given an overall safety rating of 4/5 stars by NHTSA in 2017. Over the years spanning its genesis, the Toyota brand of automobile has not lost its steam. In fact, when you combine Toyota’s longevity in the automotive world and its stellar reputation, it’s easy to see why the Toyota Rav4 has become a staple crossover vehicle. Let’s analyze exactly why the Toyota Rav4 is one of the most popular model of crossovers around today. A 2.5-liter V4 engine with 176-horsepower and 172 ft-lbs. of torque. Base models are front-wheel-drive, but all-wheel-drive options are readily available on select models. Fuel economy ratings of 23 city MPG and 30 MPG (slightly lower than the Rogue, but still moderately impressive for a crossover vehicle of its size). A six-speed shiftable automatic transmission. An abundance of mechanical features are shared between the 2017 Nissan Rogue and the 2017 Toyota Rav4, rendering both vehicles mechanically efficient in terms of fuel economy and engine size. The 2017 Toyota Rav4 offers drivers a fairly sizable amount of interior space, with a headroom clearance only two inches shy of the Rogue. The 2017 Toyota Rav4 is the tallest of 2017’s top crossovers, standing at an impressive 67.1 inches, but also has the lowest ground clearance of the three, measuring in at 6.1 inches. The 2017 Toyota Rav4 has won several safety awards, including the NHTSA 5-Star Overall Safety Rating Award. 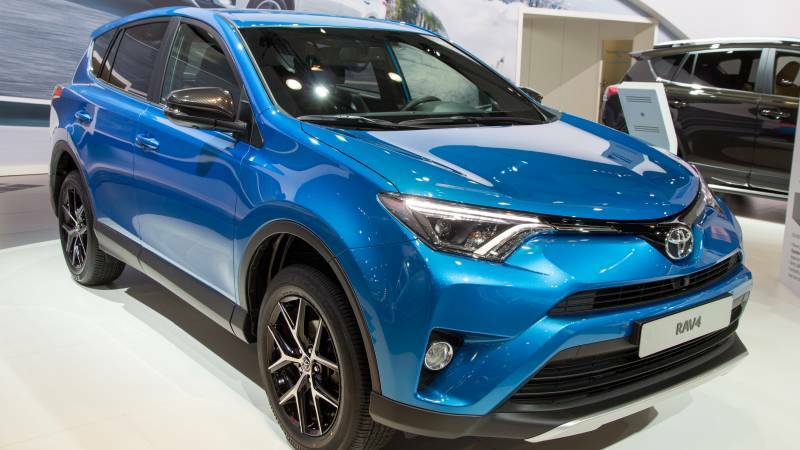 The 2016 Toyota Rav4 was selected as an IIHS TSP+ (top safety pick). The Rav4 model has also received the Industry Accolade Reward. Over 90% of Rav4s sold in the past ten years are still on the road today. General safety features include anti-lock braking systems, anti-theft systems, child seat anchors, side/curtain airbags, stability/traction control. Limited models of the Rav4 offer increased safety features as well as all-wheel-drive options, and are known to be reasonably affordable. The smallest of the three top crossovers of 2017, the 2017 Ford Escape delivers a sleeker and more aerodynamic exterior aesthetic that screams hatchback. The Escape is versatile, rugged, and efficient. Let’s have a closer look. All three crossover models presented here have extremely similar engine sizes, all of which are reminiscent of the sedan/hatchback. This, as we know, is one of the key elements of the crossover: borrowing desired features from the SUV and the hatchback/sedan and implementing them into the design of something spectacular. Mechanical features of the 2017 Escape include a 2.5-liter V4 engine with 168-horsepower and 170 ft-lbs. of torque, and a 6-speed shiftable automatic transmission. The base Escape model is front-wheel-drive, but like most crossover models all-wheel-drive drivetrain options are readily available. Fuel economy specs garner 21 city MPG and 29 highway MPG. The Escape’s fuel economy is the weakest of the three, yet is still impressive nonetheless for a vehicle of its size and stature. Like the Nissan Rogue, the 2017 Ford Escape offers an impressive 7.8-inch ground clearance that speaks for its high seating platform design and a lean toward the utilitarian style of the SUV. The interior space of the Escape is noteworthy, but not much different than the Rav4 and the Rogue in terms of headroom. The interior/exterior measurements of the three top crossovers of 2017’s are remarkably similar as well, and that’s good because the measurements simply work. The 2017 Ford Escape has not yet won any safety awards, but remember that it hasn’t been on the sales floor for very long. It certainly will be a runner up, however: the NHTSA gave the 2017 Ford Escape an overall safety rating of 5/5 stars. If you’re looking to purchase a 2017 crossover, look no further. These three models will sweep you off your feet in terms of their mechanical features, performance, safety ratings, and just overall quality and innovation in their design. All three crossover models offer elegant exterior/interior components that are all too remnant of the hatchback while also offering key frame and seating design components of the SUV. At least one thing is clear with the crossover: you get only the best of both worlds.